The author logged flights on over seventy Sunderlands, largely air tests of machines delivered from the factories in Belfast and Windermere. This practical intimacy with the aircraft has helped him to write the definitive book on this great flying boat. 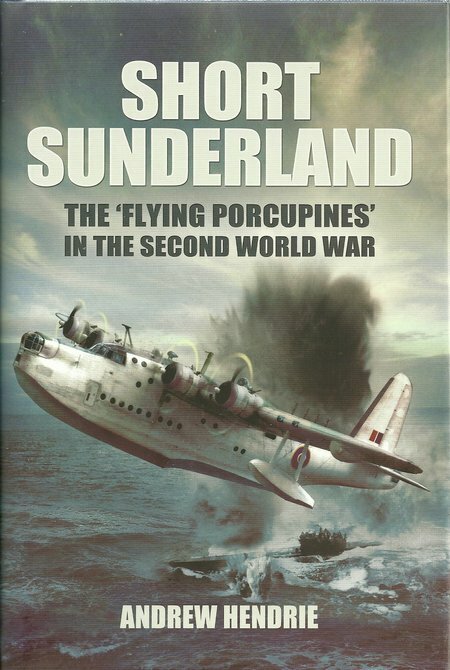 He has included details of Sunderland operations into Berlin in 1948 during the Berlin Airlift. He has also included detailed appendices to provide a comprehensive record of the Sunderland and its operation in war and peace. DESCRIPTION: It the early days of powered flight, and the lack of established airfields with hard runways encouraged the use of flying boats and sea planes that could take off from, and land on, rivers lakes and the sea. As larger, heavy and more robust aircraft were developed, engine development often lagged and the use of water as an airstrip had the great advantage that the new aircraft did not have to worry about obstructions that it would have to clear and there was no immediate distance limitation. These advantages were matched by structural and hydrodynamic restrictions that impacted on aerodynamic efficiency and, as the numbers of large airports increased, the land plane steadily replaced the flying boat. By the late 1930s, civil passenger transport was largely by land planes and the flying boat was restricted to the great long distance flights from Europe to Africa and Australia. There was, and continues to be some attraction in operating flying boats, or amphibians, in the Pacific where the host of tiny islands makes it difficult to construct landing strips capable of taking aircraft with the range to fly between islands. The flying boat and amphibian also continues to offer advantage in specialist operations, such as fire fighting, where the aircraft can land on a lake or the sea and refill its fire-fighting tanks as it taxis to take off again. In the late 1930s, the flying boat was also seen as an essential maritime patrol and naval bombing aircraft. A British Air Ministry requirement in 1933 called for a general-purpose four-engine flying boat, capable of operating from the remote outposts of Empire. Shorts developed the outstanding Sunderland flying boat to meet this requirement, using research and design started to build the Short Empire flying boat for commercial passenger transport. The Sunderland was a large deep-bodied monoplane with four powerful radial engines and three power-operated gun turrets. Although the deep body presented a large surface area, drag was contained by avoiding the bracing wires and struts that were an unavoidable feature of bi-plane flying boats of the time and the early monoplanes. The defencive armament was extraordinary for the time when most military flying boats still used manual World War One Scarf ring mounts for single or twin rifle calibre machines guns in open positions. On long cold over-water flights, it was common for military flying boats to fly with canvas covers across the open gun positions because the gunners had difficulty in surviving the long hours of patrol at their posts. Some, such as the equally famous and successful Catalina had just two machineguns, one in each of two blister observation posts, where the blisters had to be opened to fire the guns. Having one four gun tail turret, a two gun mid-upper turret, and one two gun nose turret gave the Sunderland formidable fire power at all times. As a flying boat, the Sunderland could protect its belly by flying at very low level so that a fighter could not fly under it. This earned the German nick-name of ‘Flying Porcupine’ because it was considered a very dangerous target for a fighter to attack. The reputation was so strong that a Sunderland, on a ferry flight with no guns fitted to its turrets, was attacked by a Bf 110 twin engine heavy fighter armed with canon and machine guns but frightened the German aircraft off when a crew member fired a Thomson sub-machine gun, firing .45 ACP pistol bullets, at the German aircraft from one of the turrets. The Sunderland was also able to carry an effective bomb load of general purpose iron bombs and depth bombs. The difficulty of fitting bombs to a flying boat was solved in an ingenious but highly effective manner. Tracks were fitted into the underside of the wings inboard from the two inner engines. Dollies could be winched out on these tracks through hatches in the fuselage sides. This allowed up to eight bombs, or depth bombs, four on each side to be positioned for an attack on surface or submarine targets but with the dollies to be normally inside the hull on patrol, avoiding the drag of bombs and carriers. It was also possible to carry a selection of different types of bomb inside the aircraft and arm the dollies according to target requirements. As WWII progressed, the Sunderland was equipped with radar and powerful searchlights to locate targets at sea, and fixed forward firing machine guns were fitted in the hull to suppress anti-aircraft fire during an attack run. The Sunderland served in all theatres and was highly effective in a wide range of roles, becoming a ‘maid-of-all-work’, carrying troops, casualties and covert operations personnel. Sunderlands carried mail and supplies, often operating into areas were no landing strips were available for land planes, and into areas where parachuting personnel and materials was not desirable. As a submarine hunter killer, the Sunderland was most effective and greatly feared. The only criticism is that the excellent photographs have been produced only in black and white and mostly in small sizes. Of course what the reviewer cannot know is what the size and definition quality of the originals might have been and it is entirely possible that the images have been reproduced at the maximum practical sizes. Very few, if any, would have been in full colour, and the very low price for a book of this quality would not have been possible if larger and full colour images and drawings had been included. It may therefore be a very small price to ensure maximum readership of what is a highly commended book.